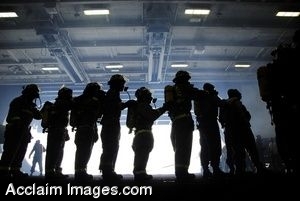 Description: DOD clipart Photo of U.S. Navy Sailors preparing to combat a simulated fire during a general quarters drill aboard USS Nimitz (CVN 68) Oct 14, 2006. Nimitz is under way conducting tailored ships training availability off the coast of Southern California. (U.S. Navy photo by Mass Communication Specialist 2nd Class Shannon E. Renfroe). Stock photography by Department of Defense Public Domain.